Kubota tractor loader backhoes might be the most versatile machine in your fleet. Trenching, landscaping, or tacking farm chores is a breeze with Kubota tractor loader backhoes. 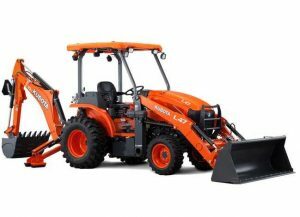 Powered by cleaner burning Kubota Tier 4 engines, the Kubota TLB Series is made to get work done, all day, every day. 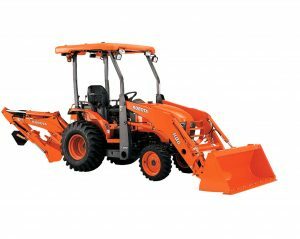 Steen Enterprises carries all three models in the Kubota TLB Series, including the B26, L47 and the bigger, 63 horsepower M62. All three compact machines are at home in tight working conditions and equipped with a backhoe, have an impressive dig depth. 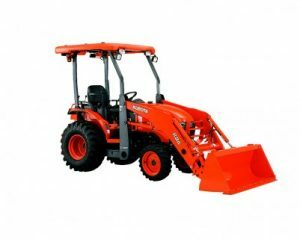 The Kubota engines on these machines deliver high power and high torque with low noise and vibration. Durable and dependable, these engines are also cleaner burning and meet all current emissions standards. Four-wheel drive keeps you rolling through the muck and mud on job sites. The Kubota 3-point hitch gives these compact tractor loader backhoes the ability to attach a wider selection of implements and larger attachments for more productivity. 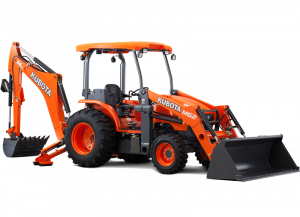 Another feature that adds to the durability of a Kubota construction tractor is the integrated main frame, which is performance matched to the loader and backhoe. This detailed pairing ensures the structural integrity of the tractor is uncompromisingly sound and built to take on the stresses of repetitive backhoe and loader work. The experienced Kubota pros at Steen Enterprises can help you choose the right model in the TLB Series and matching implements to help you get more work done faster and with less effort.